Join a choral tradition as old as Cornell itself. 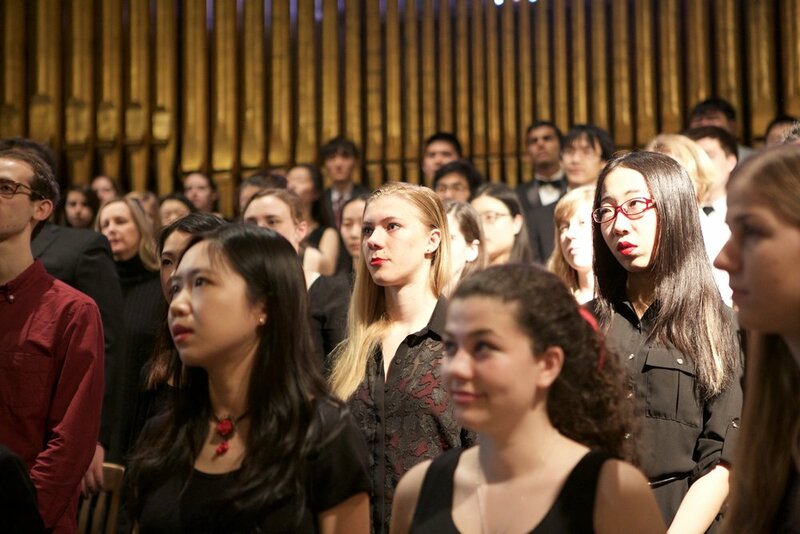 Explore the rich collection of choral ensembles available to you at Cornell. Learn more about each of them below. All of these ensembles share the same audition process. You will be selected for ensembles based on your eligibility, commitment, and skill level. Sign-ups for Spring 2019 auditions are now available. Please click on "Spring Auditions" above to learn more and sign up! The Cornell University Chorale is a mixed voice choir of over 100 singers that focuses on the developing each individual's vocal technique and musicianship. Members learn crucial skills that enable them to pursue in a lifetime of musical exploration. The group is comprised of both Cornell students and Ithaca residents, allowing members to meet members of their local community. The Cornell University Glee Club (TTBB) is one of our two flagship groups, and a premier touring ensemble. It boasts a history of 150 years of brotherhood and musical excellence. The group performs regularly on campus, sings for major university events, and embarks on domestic or international tours every year. The Glee Club frequently collaborates with the Chorus to explore SATB repertoire. The Chorus (SSAA) is a premier touring ensemble and our other flagship group. The Chorus is comprised of treble singers who also happen to be incredible leaders, collaborators, and friends. They perform at Cornell University and in the Ithaca area, and embark on domestic or international tours every year. The Chorus frequently collaborates with the Glee Club to explore SATB repertoire. The Chamber Singers is a tightly knit chamber choir, rehearsing once per week in an environment that promotes strong musicianship, personal responsibility, and music literacy. Its members perform music from Bach motets to modern Estonian folk pieces to the works of local composers on the rise. To audition for Chamber Singers, you must have two semesters in either the Glee Club or Chorus, or equivalent collegiate experience as determined by the director. 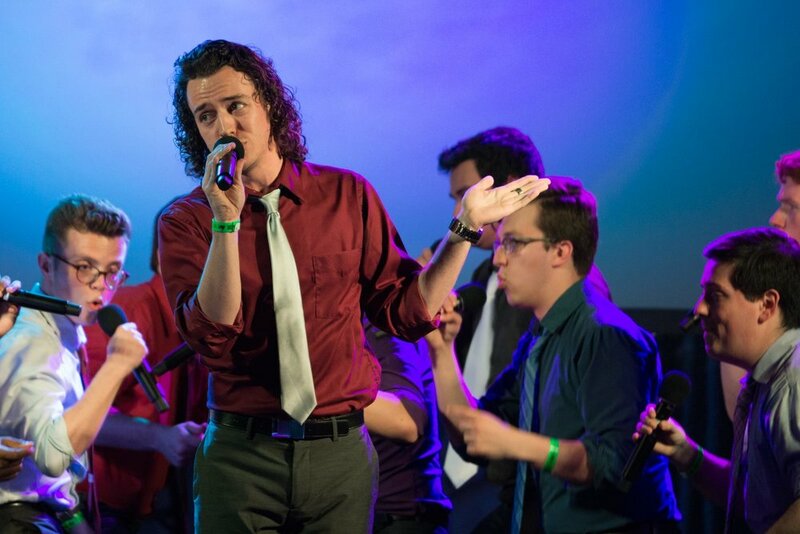 The Hangovers, the official a cappella subset of the Glee Club, and the oldest a cappella group on campus, was formed with the purpose of exploring alternative forms of musical expression in addition to the traditional choral repertoire. They sing quite a wide variety of musical styles including jazz, pop, traditional choral, as well as several original compositions and parodies. To audition for the Hangovers, you must be a member of the Glee Club. After Eight is the official a cappella subset of the Chorus. 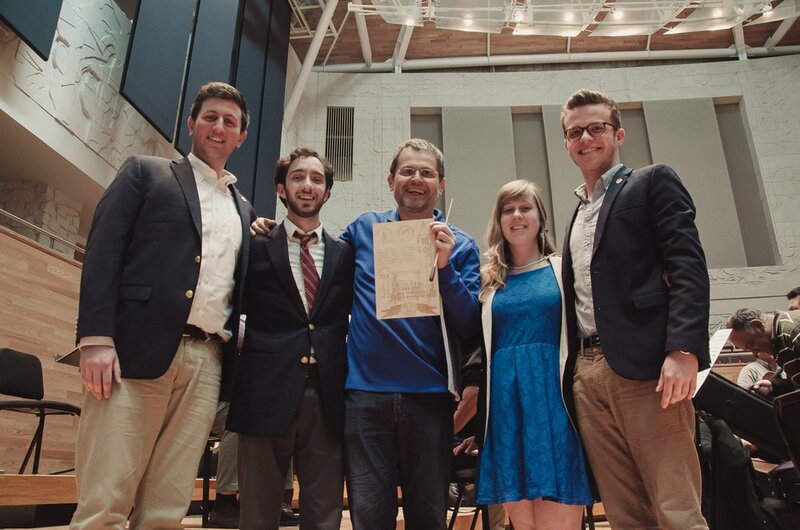 With a mission to be entertaining, in tune, and fun, they regularly perform contemporary repertoire at semesterly concerts and student and alumni events on campus throughout the year. To audition for After Eight, you must be a member of the Chorus. Connect with students from every major and every school. For a freshman or incoming sophomore, the Glee Club, Chorus, or Chorale offer one of the earliest opportunities to join a student run organization at Cornell. It is also a great opportunity to meet and befriend literally hundreds of other Cornell students. The Glee Club, Chorus, and Chorale contain members from every school, from the College of Engineering, to the College Arts and Sciences, College of Agriculture and Life Sciences and College of Human Ecology. There are singers that study architecture and urban planning in the College of Architecture, Art and Planning, or study in the School of Industrial and Labor Relations or School of Hotel Administration. Singers play intramural sports, lead prominent organizations on campus, are members of fraternities and sororities, and are members of project teams. 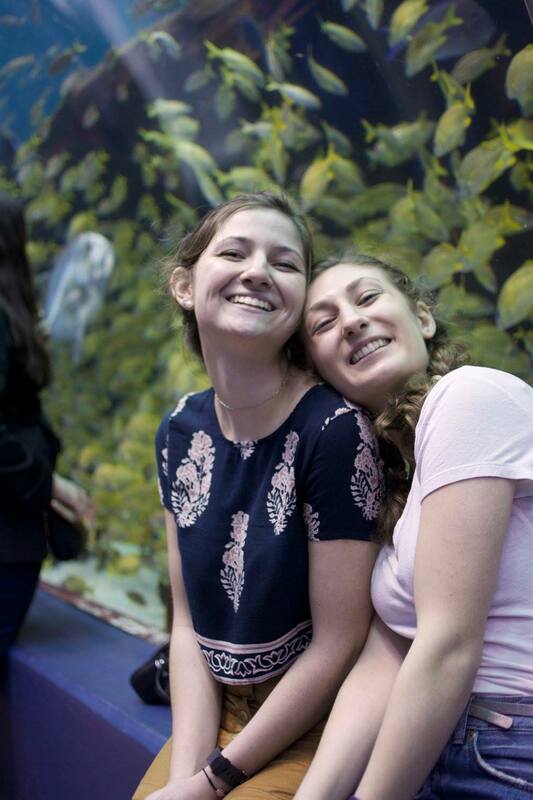 If you are looking for advice, or just looking to make your first lasting friendships at Cornell, you can find it here. Our choral community here loves to celebrate our close-knit community with special events. 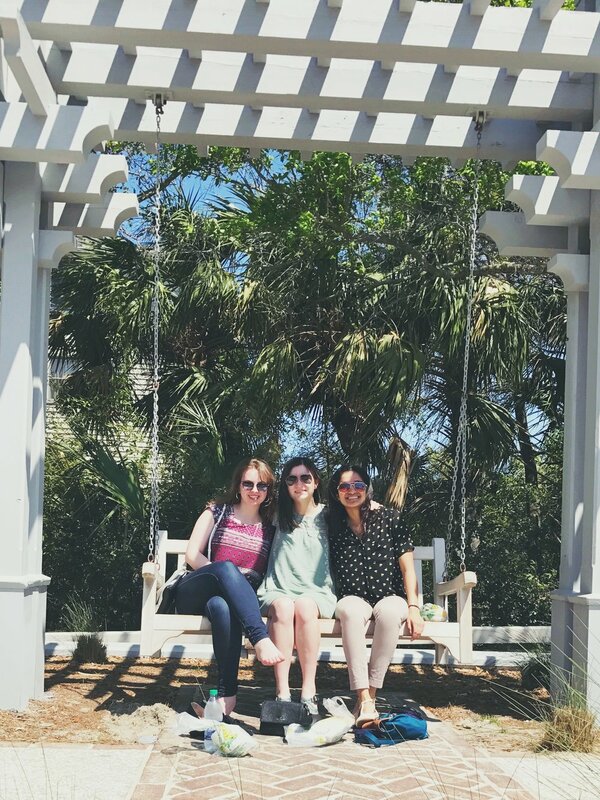 Whether it is an end-of-semester Christmas party at the Glee Club house, a yearly formal celebration, or a Glee Club & Chorus Wine Tour trip, there's always a fun event planned by our student leaders on the horizon. In the end, music is and always will be the core of what brings us all together. All images on this page are of the Glee Club, Chorus, or Chorale in the past two years, including pictures of current members and alumni. Mouse over each photo to see when and where it was taken. Have fun exploring the rest of the page below! Explore new cultures and share your singing. Each year, the Chorus and Glee Club each embark on a tour to bring a selection of the year's repertoire, along with the ensemble's set of permanent music and some good Cornellian spirit to a different part of the world. Every few years, these two ensembles might join forces to embark on an international tour. Past destinations for international tours include Guatemala, Mexico, China, Venezuela, France, and Switzerland. Touring is a huge part of the choral tradition for the Chorus and Glee Club. We find incredible value in bringing our choral music to fresh audiences, young children, or underprivileged communities. Music can be an effective educational tool, inspiring the next generation of composers, or the next generation of leaders and thinkers. It can be an even more powerful tool for unity, bridging language barriers and cultural differences by finding common ground in musical melody, a language that everyone can understand. As choral ensembles of Cornell University, we find that it is our duty to use music to its fullest extent in enriching the world and society that we live in. Work on entirely student driven projects and see them come to life. The Glee Club and Chorus have an extensive and well organized system of leadership, comprised of student officers, executive board positions, and music voice section leaders. 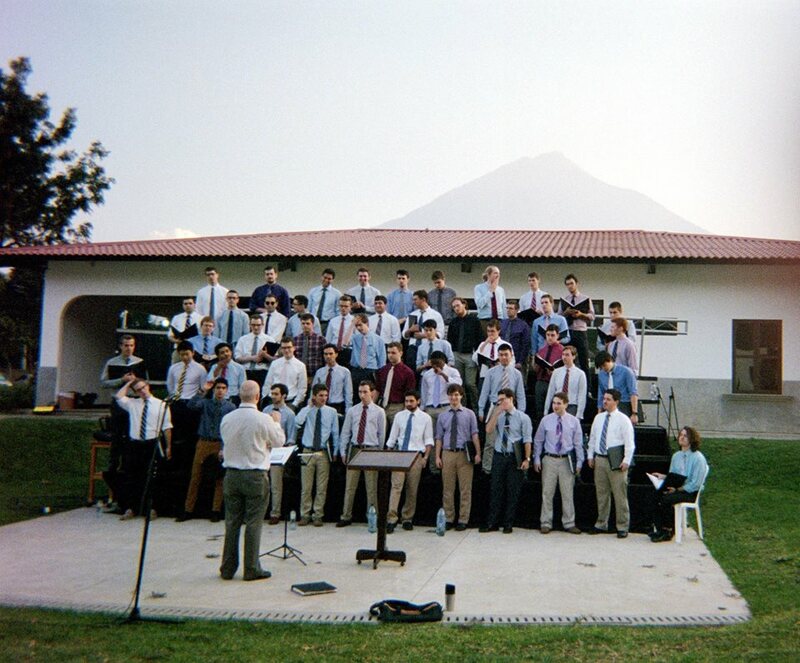 Students are given incredible responsibility in planning and managing tours, dealing with ensemble finances, producing a few dozen concerts a year, and communicating with the rich body of alumni that support each ensemble. The lessons you learn as an officer are invaluable, and also ones you cannot learn in a classroom. Discipline and organization become necessary traits to have, as well as being able to establish efficient and respectful work relationships with your peers. 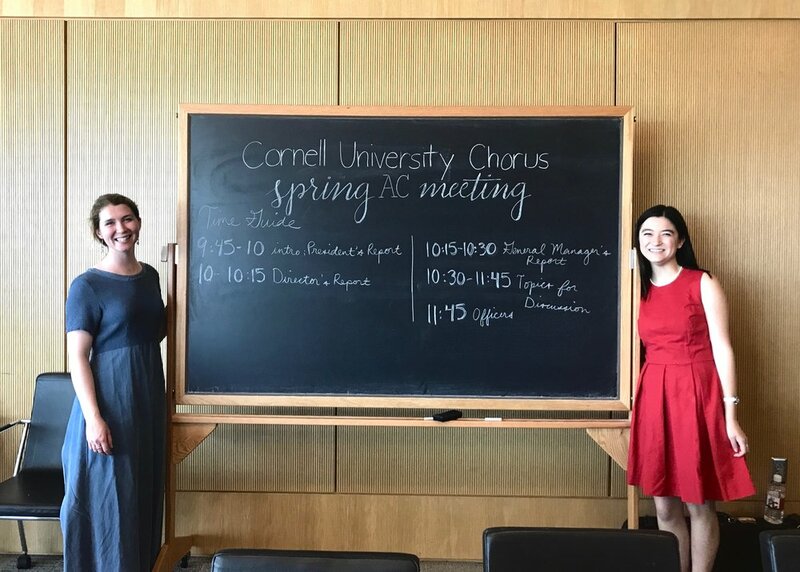 The business of running a choral ensemble is surprisingly complex, but functions as a great crucible of leadership that has benefitted hundreds of Cornell students for generations, and continues to benefit them today. Sing with the strength of a hundred voices. All choral ensembles at Cornell perform multiple times each year. 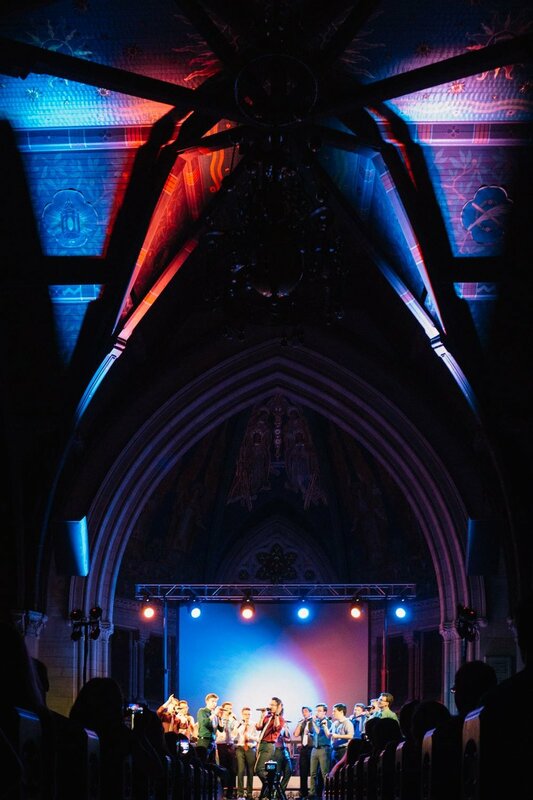 They take place in the grand performance space inside of Bailey Hall, or under the painted arches of Sage Chapel. Groups can also perform at receptions, and in university events like Commencement and Convocation or at the inauguration of a new president. 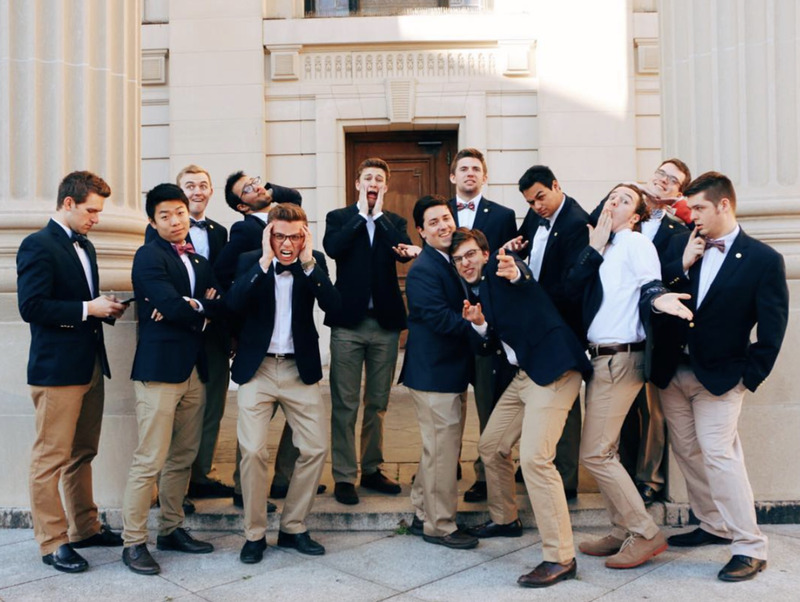 The a cappella subsets of the ensembles also perform all around campus, for dinners, graduations, and fraternities and sororities. You cannot go through four years of Cornell without hearing our ensembles perform at least once or twice. Develop close relationships with faculty and build your vocal technique. Robert Isaacs is the director of choral activities at Cornell University, a position generously supported by Priscilla E. Browning. He has conducted Cornell choirs in performance at Carnegie Hall, the Kennedy Center, and the U.S. Supreme Court, led them on tour to over sixty cities across the United States, Mexico, and Guatemala, and prepared them for nine world premieres. Previously, Robert ran choral programs at Princeton University and the Manhattan School of Music, and served as interim director of the National Youth Choir of Great Britain. He has worked as a guest conductor with ensembles on both sides of the Atlantic, including Laudibus, Cerddorion, Amuse, TENET, and the Vox Vocal Ensemble. Robert made his conducting debut at Carnegie Hall with the Argento New Music Project, and has also conducted at the Royal Albert Hall in London, the Edinburgh Fringe Festival, the Guggenheim Museum, the Snape Proms, and other venues ranging from Stockholm to the Cook Islands. As a singer, Robert regularly tours and records with Pomerium, the Vox Vocal Ensemble, and many others; he was nominated for a Grammy Award in 2006. Robert holds degrees from Harvard University (choral music) and Columbia University (creative writing), and spent an equally educational period as a juggler and unicyclist on the streets of San Francisco. Stephen Spinelli is the assistant director of choral programs at Cornell University, where he conducts the Cornell Chorale and Chamber Singers, and is the assistant director of the Glee Club and Chorus. He is also the director of the chancel choir at First Presbyterian Church in Ithaca. Previously he worked at Abington Friends School (Jenkintown, PA) as the director of middle and upper school choirs. Steve also held positions as the choral director at Philadelphia University and as an assistant conductor for the Pennsylvania Girlchoir. Visiting appointments include Moravian College and Villanova University. Stephen has sung and recorded extensively with the Grammy-nominated contemporary music choir The Crossing (Philadelphia, PA). He is also the accompanist for the Bennington Voice Workshops in Bennington, VT, and serves on the board of directors of the vocal octet Roomful of Teeth, for whom he assisted in the production of a Grammy Award-winning debut album, as well as their recently Grammy-nominated sophomore album, Render. His research interests include non-Western singing techniques, as well as the development of the Lutheran Cantata. Stephen holds degrees from Williams College (BA, music) and Temple University (MM, choral conducting), and is currently a DMA candidate in choral conducting at Northwestern University. Find us on Facebook, Youtube, and Instagram. Keep up with the Chorale, Glee Club, Chorus, and Chamber Singers! Click the buttons below to take a look at their websites and check out a few of our videos and performances below, and follow us on Instagram.